EDMONTON, Alberta, Canada (June 27, 2017) - World Boxing Organization (WBO) Welterweight World champion Manny "Pacman' Pacquiao (59-6-2, 38 KOs) and his Hall-of-Fame trainer, Freddie Roach, held a media workout today in Australia, preparing for this Saturday night's showdown between Pacquiao and his title challenger, Jeff Horn(16-0-1, 11 KOs). "Battle of Brisbane: Pacquiao vs. Horn," presented by Top Rank and Duco Events. will air this Saturday evening, exclusively in Canada on Super Channel, live from Suncorp Stadium in Brisbane, Australia. Super Channel subscribers will be able to watch four exciting fights, starting at 9 p.m. ET / 6 p.m. PT, on the "Battle of Brisbane" card, headlined by Pacquiao vs. Horn. MANNY PACQUIAO: "We have a really good plan for this fight. We worked hard in training camp both in Manila and in General Santos City. I'm totally focused for this fight. I am not looking past this fight because at this point in my career, every fight is the most important. There are no tomorrows if I don't win today. "Jeff Horn is OK. I've watched video of his fights. He brings a lot of action into the ring. "I know what he is feeling. I remember everything about my first world title fight. "Being a senator and training for a fight is hard. It takes discipline and time management. Luckily, the Senate has been in recess for the past few weeks and I have been able to focus on training for my world title fight. "A Senator's job is to defend his people ... to fight for their rights. "I know Jeff Horn used to be a teacher. In the ring, I'm a teacher too. "I am ready for Jeff to come out and be aggressive. If he does that it will be a great fight for the fans. "The biggest crowd I ever fought in front of was at Cowboys Stadium against Joshua Clottey. I'm told this could be bigger [51,000+]. I am very excited for doing that, even though they may not be rooting for me. I am also very happy that ESPN will be televising it live.to the U.S. Now everyone can see it. It's good for boxing." 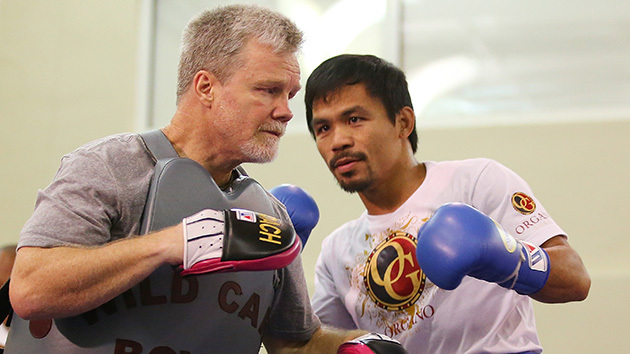 FREDDIE ROACH: "Manny is a performer. He loves people, loves a big audience. Brisbane has all that for this fight. He'll be fighting in front of the biggest crowd of his career. "Not everyone gets the opportunity to fight for a world title. It was always my dream but I never fought for one. It's a big deal. Jeff Horn earned this opportunity. He is the WBO's mandatory challenger. "Manny gave me 110% in training camp. He always does. No one works harder in the gym. The difference in this camp from recent ones has been his aggression. He's scored several knockdowns and I haven't seen that in years. He has kept his foot on the pedal throughout, even when he's had a sparring partner in trouble. After his ring work he is singing and dancing - not well - but that's not the point. He is really hungry to make a statement in this fight against Horn. He's even playing Shakira during his workouts again and he hasn't done that in years." Saturday night's Super Channel telecast will also feature two-time Irish Olympian Michael Conlan (2-0, 2 KOs), from Belfast, in a six-round featherweight bout against Jarrett "Juarez" Owen (5-4-3, 2 KOs), of Brisbane.In the 12-round co-feature,International Boxing Federation (IBF) junior bantamweight world champion Jerwin "Pretty Boy" Ancajas (24-1-1, 16 KOs), of Cavite City, Philippines, will defend his title against top-rated contender Teiru Kinoshita (25-1-1, 8 KOs), of Kobe, Japan. The live telecast will open with an eight-round middleweight bout between Shane Mosley, Jr. (10-1, 7 KOs), of Pomona, Calif. and son of former three-division world champion "Sugar" Shane Mosley, and David Toussaint (10-0, 8 KOs), of Canberra, Australia.